Shopping at farmers markets is the easiest way to eat locally. You know where the food comes from: After all, the grower is right there and you can ask them. More than one shopper, however, has come home with bags of produce that went uneaten. And many others have left after a morning's tour around the stalls only to go home with a bunch of carrots and a dazed expression. A bit of planning can keep weekly shopping for produce at a farmers market fun and make cooking a snap all week long. For the best deals, go to the farmers market late. Farmers and other vendors sometimes discount products instead of loading them back up and schlepping them home. (Check out these other Tips to Save Money at Farmers Markets.) Farmers raise this food for a living, however, so don't expect or ask for deep discounts. Importantly, some markets have rules against end-of-the-day discounts. Some farmers market vendors offer bags, but they tend to be thin and flimsy plastic ones that groan under the pressure of any substantial produce purchase. Make sure everything gets home from the farmers market without crashing onto the sidewalk or spilling onto the floor of your car by bringing your own sturdy canvas or nylon bags. A backpack can make the hauling easier, especially for weighty or bulky items. I love RuMe bags because they fold small and carry tons. Although vendors will make change, purchases will go easier and faster if you have exact (or close to exact) change. At some farmers markets, "small change" means dimes and nickels. In larger urban areas many products at farmers markets are sold in dollar or fifty-cent increments. Since you know what you're likely to find at the farmers market, you can do a bit of meal planning and shop accordingly. For example, if local asparagus has just come into season and you can't get enough, you know you'll want to eat some Roasted Asparagus, some cooked into an Asparagus Chickpea Soup, and some sliced raw in an Asparagus Butter Lettuce Salad. So you'll know both how many bunches of asparagus to buy and that you'll also need some spring onions or herbs to add to the soup and some salad greens. 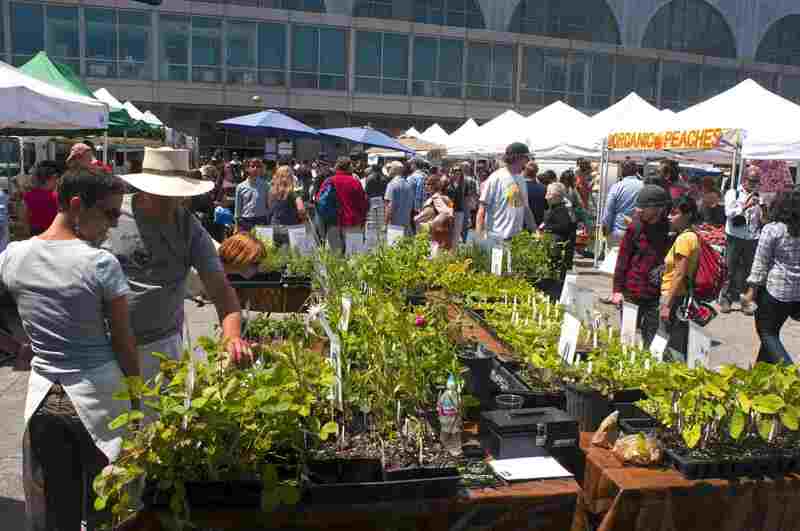 Yes, you’ll fare better if you plan your trip to the farmers market. However, you need to leave a bit of wiggle room for those strawberries you didn't know would be at market so early, or the zucchini blossoms you've never tried before. Trying new things is part of the fun of going to farmers markets. The best deals at the farmers market are had when you buy in bulk. You'll enjoy the best flavors and the best prices when you buy lots of whatever is at its harvest peak. How to use it all up? Try new recipes with favorite vegetables or learn the lost art of preserving food. Freezing, canning, and drying are just some of the ways you can save seasonal tastes you find at the farmers market for later in the year. You’re buying ultra-fresh produce when you shop at the farmers market, so let its natural flavor show when you cook it. Keep preparations simple. You’ll make cooking easier and you’ll be likely to try (and eat) even more local foods from the farmers market next week.